Fundamentals of General, Organic, and Biological Chemistry by McMurry, Ballantine, Hoeger, and Peterson provides background in chemistry and biochemistry with a relatable context to ensure students of all disciplines gain an appreciation of chemistry’s significance in everyday life. Known for its clarity and concise presentation, this book balances chemical concepts with examples, drawn from students’ everyday lives and experiences, to explain the quantitative aspects of chemistry and provide deeper insight into theoretical principles. 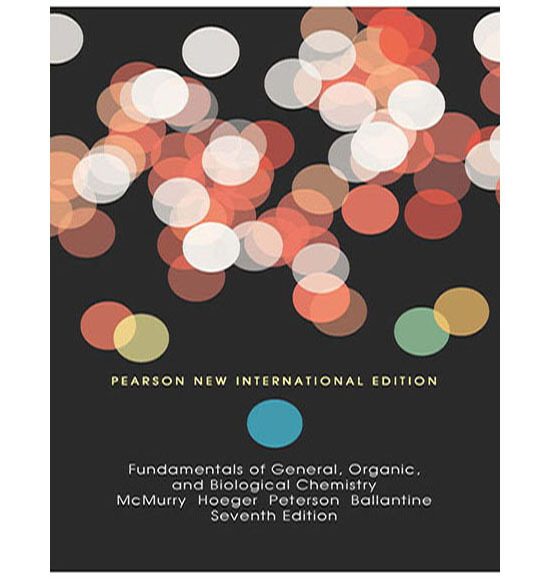 The Seventh Edition focuses on making connections between General, Organic, and Biological Chemistry through a number of new and updated features — including all-new Mastering Reactions boxes, Chemistry in Action boxes, new and revised chapter problems that strengthen the ties between major concepts in each chapter, practical applications, and much more. Concepts to Review call attention to the connections between general, organic, and biological chemistry–connections which students might not recognize otherwise. Starting with Chapter 3, the Concepts to Review section at the beginning of the chapter lists topics from earlier chapters that form the basis for discussion in the current chapter. Concept link icons indicate areas where previously covered concepts are relevant to the discussion at hand. This highly praised feature provides cross-references and highlights important chemical themes as they are revisited. Looking Ahead notes call attention to connections to concepts in forthcoming chapters. These notes illustrate to the students why what they are learning in this discussion will be useful in understanding future concepts. NEW! Concept Maps at the end of appropriate chapters illustrate and reinforce the connections between concepts discussed in each chapter, and concepts in previous or later chapters. Worked Examples provide problem-solving strategies to enable student understanding. Most Worked Examples include an Analysis section that precedes the Solution. The Analysis lays out the approach to solving a problem of the given type. When appropriate, a Ballpark Estimate gives students an overview of the relationships needed to solve the problem, and provides an intuitive approach to arrive at a rough estimate of the answer. The Solution presents the worked-out example using the strategy laid out in the Analysis and, in many cases, includes expanded discussion to enhance student understanding. When applicable, following the Solution there is a Ballpark Check that compares the calculated answer to the Ballpark Estimate, and verifies that the answer makes chemical and physical sense. Key Concept Problems integrated throughout the chapters focus attention on the use of essential concepts, as do the Understanding Key Concepts problems at the end of each chapter. These problems immediately focus students’ attention on essential concepts and tests their comprehension. Understanding Key Concepts problems are designed to test students’ mastery of the core principles developed in the chapter. Students thus have an opportunity to ask “Did I get it?” before they proceed. Most of these Key Concept Problems use graphics or molecular-level art to illustrate the core principles and will be particularly useful to visual learners. Comprehensive problems within the chapters, for which brief answers are given in an appendix, cover every skill and topic to be understood. One or more problems follow each Worked Example and ¬others stand alone at the ends of sections. These allow students to practice and test their mastery of core principles within each chapter. More color-keyed, labeled equations–Students often skip looking at a chemical equation while reading. The text extensively uses color to highlight the aspects of chemical equations and structures under discussion, a continuing feature of this book praised by users. Applications are both integrated into the discussions in the text and set off from the text as Chemistry in Action boxes. Each Chemistry in Action feature provides sufficient information for reasonable understanding and extends the concepts discussed in the text in new ways. The application is followed by a cross-reference to end-of-chapter problems that can be assigned by the instructor. NEW! Mastering Reactions feature boxes include How Addition Reactions Occur, How Elimination Reactions Occur, and Carbonyl Additions; they discuss how these important organic transformations are believed to occur. This new feature allows instructors to easily introduce discussions of mechanism into their coverage of organic chemistry. NEW and updated Chemistry in Action boxes (formerly Application boxes) provide a stronger thread among each application example, drawing connections between General, Organic, and Biological Chemistry. NEW Mastering Reactions boxes discuss the “how” behind a number of organic reactions in relative depth. NEW and revised In-chapter questions–specifically related to Chemistry in Action applications and Mastering Reactions–strengthen the connection between the chapter content and practical applications. NEW Concept Maps are added to appropriate chapters to draw connections between General, Organic, and Biological Chemistry—particularly those chapters dealing with intermolecular forces, chemical reactions and energy, acid-base chemistry, and relationships between functional groups, proteins and their properties. NEW and updated concept links provide more visual reminders to indicate where new material builds on concepts from previous chapters. Updated questions in the end of chapter section build on Concept Links. Questions will require students to recall information learned in previous chapters. NEW and updated end-of-chapter (EOC) problems–Approximately 20-25% of the end-of-chapter problems have been revised to enhance clarity. All chapter goals are now tied to end-of-chapter (EOC) problem sets. Chapter summaries include a list of EOC problems that correspond to the chapter goals, for a greater connection between problems and concepts. Chapters 1 and 2 have been restructured, with greater emphasis on building math skills. Chapter 6 (Chemical Reactions) has been reorganized into two chapters: Chapter 5 (Classification and Balancing of Chemical Reactions), and Chapter 6 (Chemical Reactions: Mole and Mass Relationships). This restructuring enables students to narrow their focus; chapter 5 focuses on the qualitative aspect of reactions, while chapter 6 focuses on calculations.